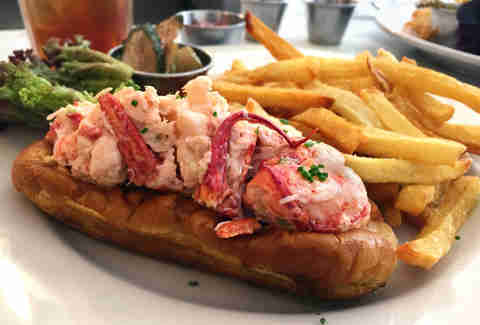 When deep in the throes of a New York City winter, huddled over a non-working radiator with a bowl of suspiciously unlabeled soup, it’s hard not to muse about the perfect image of summer: hot -- but not unbearably hot -- weather, seemingly unburnable tan skin, and the absolutely perfect lobster roll. But like the first two, the latter dream isn’t so easy to come by. While the Bronx might fool you, New York City isn’t New England; a perfect, fresh lobster roll by the water isn’t the most attainable thing here. 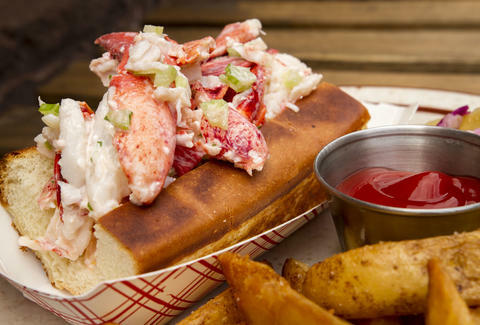 That’s not to say that New Yorkers don’t have access to lobster rolls. Basically any rooftop bar or boat with a functioning kitchen offers one. But not everyone is able to pull off that perfectly fresh, New England-quality roll. Plus, lobster is expensive (unless you’re getting it in Chinatown, which you absolutely should be). So when it comes to getting a great lobster roll, it’s important that it justifies the high price in the form of plentiful, fresh lobster meat; a nicely toasted bun; and all the other toppings, sides, and general good feelings that can momentarily transport you from Greenpoint to Maine or Connecticut. That’s exactly what these seven places accomplish. At its three different NYC locations -- plus a truck and Smorgasburg! 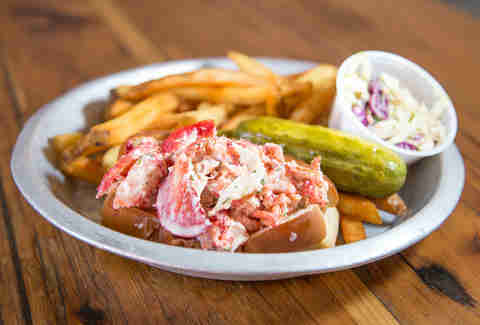 -- this Red Hook-born restaurant (which is still at its best at its original, beach shack-inspired Brooklyn spot) does several different types of lobster rolls, including standard Maine and Connecticut styles, alongside new takes like a BLT lobster roll with chipotle mayo and Applewood-smoked bacon, or a surf & turf roll with prime rib. 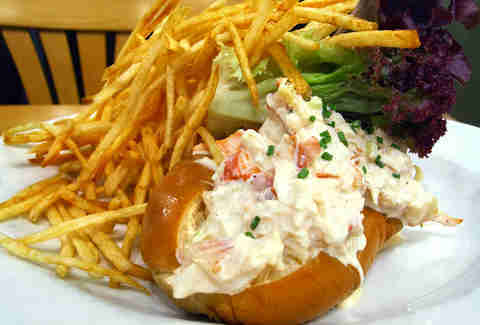 Still, classics are key when it comes to the perfect lobster roll, and the original (cold) Maine roll and (hot) Connecticut roll reign supreme here, each packed with a bulging amount of Maine claw and knuckle meat (almost too much to keep the split-top bun intact) and served alongside coleslaw, a pickle, and your choice of salad. Tucked away inside Chelsea Market, the Lobster Place is a seafood dream world, boasting the largest retail selection of seafood in New York, an omakase bar, a raw bar, and a steamed lobster counter. 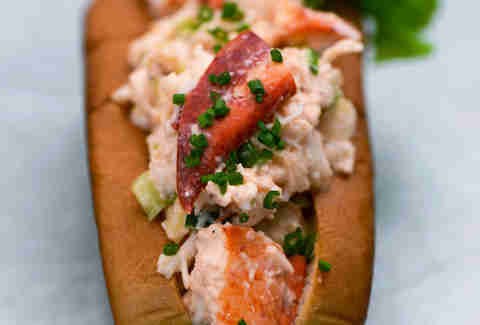 But the move is to somehow tune everything else out, grab a seat at the bar inside its sister restaurant, Cull & Pistol, and order one of the warm Connecticut-style lobster rolls made with claw and tail meat, celery, scallions, mayo, and lemon on a buttery, grilled split-top bun, and served alongside a heaping pile of thin-cut “New Bay Fries” (which are essentially house-made Old Bay fries). Above all other West Village lobster roll haunts (of which there are quite a few, including The Mermaid Inn and Mary’s Fish Camp), Pearl Oyster Bar (from Mary’s ex, Rebecca Charles) consistently comes out on top. The $30 price tag may not be the most appealing, but you get your money’s worth in the form of a heavily loaded roll -- like, to the point where silverware is necessary, and there’s almost no point in a bun even existing -- that’s coated in mayo, topped simply with chives, and served with shoestring fries on the side. The owners of the Lobster Joint claim to have brought upscale food to the traditional New England seafood shack experience, but for the most part -- aside from the $21 price tag -- the experience skews far more shack-y than fancy (particularly if you dine at the oceanside Rockaway location). 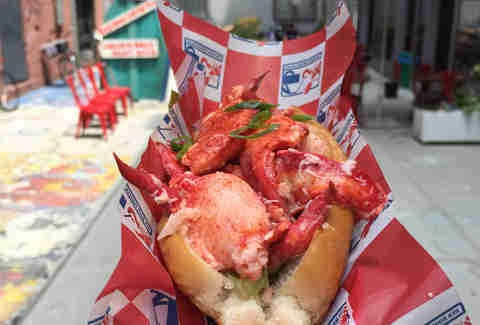 Like Red Hook Lobster Pound, the Lobster Joint offers a variety of rolls, including the traditional New England and Connecticut varieties; the former comes cold with celery and herb mayo, and the latter warm with butter. If you’re going with a friend, grab both, and do a side-by-side taste test to find out which team you’re on (the hot vs. cold lobster roll is probably the region’s most hotly debated topic ever). As at Pearl, the roll at Ed’s doesn’t come cheap (its market price is also typically around $30). In fact, owner Ed McFarland once worked at Pearl, and was accused by Rebecca Charles of copying the formula for his own spot. Still, there’s a reason this diminutive SoHo spot has remained a lobster roll staple for so many years -- and it’s not because it’s a carbon copy of another great place. Ed’s roll is far less mayo-y than Pearl’s, though it’s still made with plentiful hunks of lobster meat in a toasted, buttery roll. It’s also accompanied by some of the best fries you can get alongside a lobster roll in New York -- crispy, with just the right amount of salt. But the best thing about having a lobster roll at Ed’s is that you can grab a stool on a weekday afternoon (when every other restaurant on Lafayette has an hour-long wait) and meet all different kinds of people -- from SoHo workers, to residents, to tourists -- all there in the name of a great lobster roll. Part fish market, part restaurant, Greenpoint Fish & Lobster has one of the city’s best raw bar selections, with the added bonus of counter seating for a clear view of all the shucking. It’s easy to stop in solely for the daily selection of oysters, which would be anything from Kumamotos, to Wellfleets, to Irish Points, but the main attraction is still the Maine-style lobster roll, made with lots of fresh meat, a little mayo, celery, lemon, and a touch of tarragon on a toasted bun (plus citrus-cabbage slaw, fries, and house-made pickles on the side). Though barely two years old, the Brooklyn seafood destination stands its ground admirably, mainly due to how seriously fresh its fish is. Luke Holden’s quick-growing, fast-casual lobster chain (which started humbly in a tiny East Village shop) still offers one of the city’s most affordable lobster rolls, at just $17. 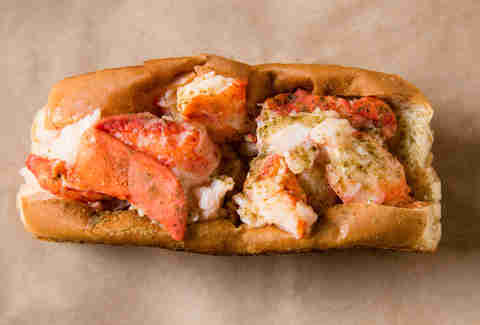 But the appeal goes beyond the price tag -- it’s about the ultimate Maine lobster roll, made with a quarter-pound of fresh Maine lobster, a little mayo, and some chives inside a buttery, well-grilled split-top New England bun. 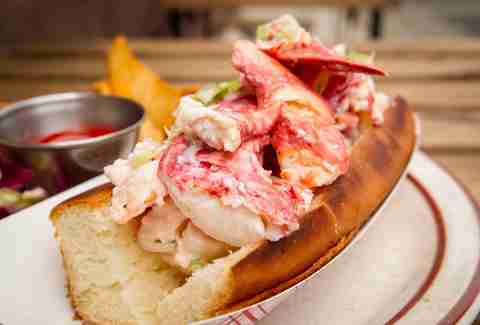 The fact that it’s cheap (as far as lobster rolls go) and crazy-accessible (with four proper locations, a stand in Gansevoort Market, two trucks, and a cart, not to mention locations in eight other cities) means its popularity shows no sign of waning. Lucy Meilus is Thrillist’s New York Editor and will work for lobster rolls. Follow her on Twitter and Instagram.